The recent arrival of the AMD R9 280X graphics card, which is an exact copy of the popular Radeon HD 7970, has brought new questions. If the card is the same then can it work with the older Radeon generation in CrossFire mode? It turns out it can. A group of hardware enthusiasts have confirmed this by installing a Radeon HD 7970 and a R9 280X video card in a single PC with both cards working in CrossFire. In addition the current AMD graphics drivers fully support the combination. The same is true for slower Radeon graphics cards of both generations as long as they feature the same GPU. Although it has been just a few days since the new 3D cards debut Gigabyte has already prepared factory overclocked video cards of the new Radeon family. 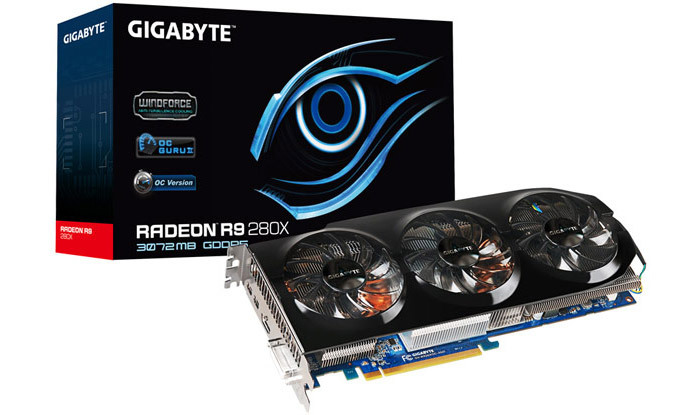 The company now offers Radeon R9 280X and R9 270X Overclock Edition cards known as GV-R928XOC-3GD and GV-R927XOC-2GD respectively. The GV-R928XOC-3GD model offers a R9 280X GPU with 2048 stream processors, 3 GB of GDDR5 memory with a 384-bit bus, 1000 MHz of clock speed for the GPU (1100 MHz in Turbo mode) and 6000 MHz of clock speed for the memory. The GV-R927XOC-2GD model is based on Radeon R9 270X GPU and has 1280 stream processors at 1050 MHz (1100 MHz in Turbo mode) and 2 GB of GDDR5 memory at 5600 MHz accessed over a 256-bit bus. Both cards are cooled by Windforce 3X coolers. Pricing is unknown.